Every Spyder forum site has blogs and blogs about excessive tire wear and as the rider drives down the road the Spyder is “wandering ”or "darting".…The most common excuse is: it is the "crown" in the road.... It is not the crown of the road "IT IS ALIGNMENT"
Mike invented special "patented" adapters that attach to the steel center spindle,where the wheel bearing is located.This is the exact center of the rotating front wheel mass. 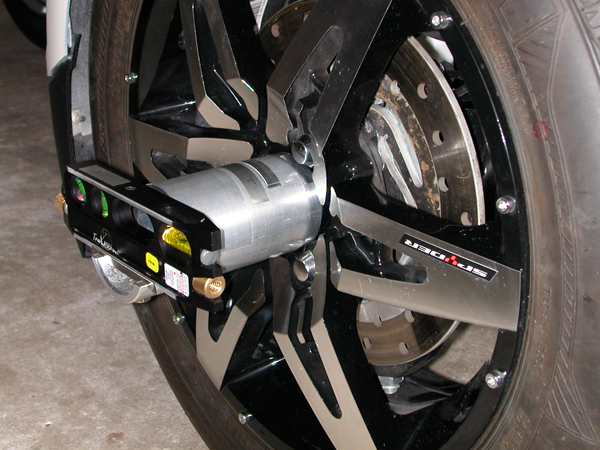 It is the only way that you can get a true alignment measurement, any other point will not be accurate. These adapters are machined PERECT with no run out, so the laser beam measurements are to the "thousands" or even a better description " to the width of a HUMAN HAIR". We will also be attending various motorcycle shows, see "Travel Schedule for Laser Alignments"